Any plant that wins the RHS Garden Merit Award has to have something going for it and Achillea Coronation Gold is such a plant. It has been in cultivation since the Queen’s Coronation and gets its common name from this. Flowering in summer, it will reach around 1.2 metres in height. The foliage is a green to grey, feathery leaves and each stem has terminal flowers spikes. The flowers a clean yellow, pink tinges can appear as they age. This isa drought tolerant plant when grown in a good soil. Some extra water during very dry summers can be beneficial. Achillea ‘Coronation Gold’ looks at its best when planted en masse or in a large clump. The flat yellow flowers heads make a great display for many weeks. 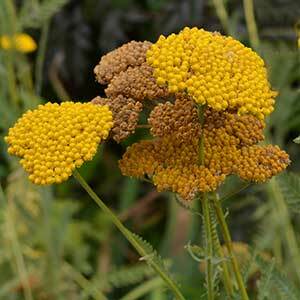 Plant Achillea ‘Coronation Gold’ in a humus rich soil, well drained and in a sunny position. Water regularly trough the first summer, after this little watering will be required. At the end of winter, prune the plant right back to the new basal growth. A little top dressing with some well rotted compost and a little aged cow manure will be beneficial. Established clumps can be divided as an easy means of propagation. Achillea Coronation Gold is available for sale from the following nurseries.